Hiring Managers’ and Corps Members’ are highly limited and therefore very valuable. TFA staff members would spend upwards of 40+ hours optimizing the experience manually. There were walls of post-it notes and lots of spreadsheets; additionally logging all of the interviews and job offers after the fact was time consuming and onerous. My team and I interviewed hiring managers and observed the hiring fairs they conduct themselves. In doing so, we identified some opportunities for efficiencies and automation, while still allowing them to feel in control of the day. We designed and tested wireframes, opting for early on lightweight low-fidelity prototype testing owing to the complexity of the code necessary for the final solution. By the time it went to development, we were sure we had the process right. We continued to test and monitor the tool’s use over the course of interview season. The average time to setup these interview days was down to only a couple of hours per fair and compliance data entry was built into the tool’s execution requiring less than 5 minutes of additional time per interview day. The first year the tool was used, satisfaction by both hiring managers and corps members improved. 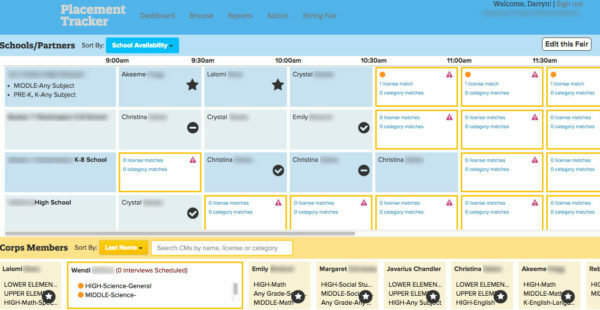 One of the initial low-fidelity wireframes I designed for the Interview Matchmaker tool. 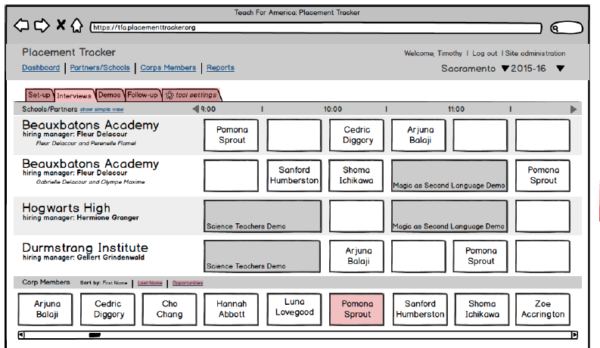 Each horizontal row represents the schedule for a single interviewer; the bank of interviewees at the bottom can be placed into open slots in the grid above. Onboarding was a challenge for new hires due to the complexity involved. 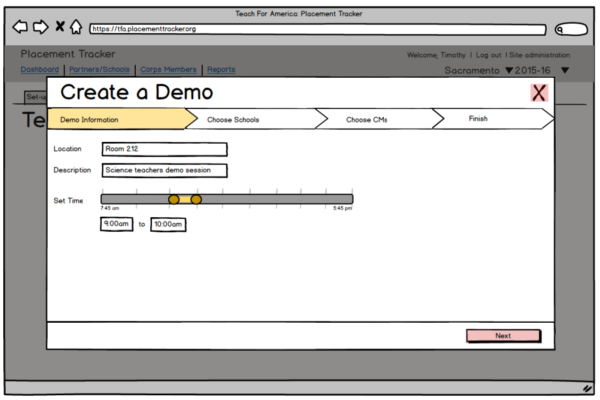 We designed wizards to walk people through infrequently accessed business processes and features, such as this one wherein a user would schedule a teaching demo which had multiple interviewers and interviewees in a room at the same time. 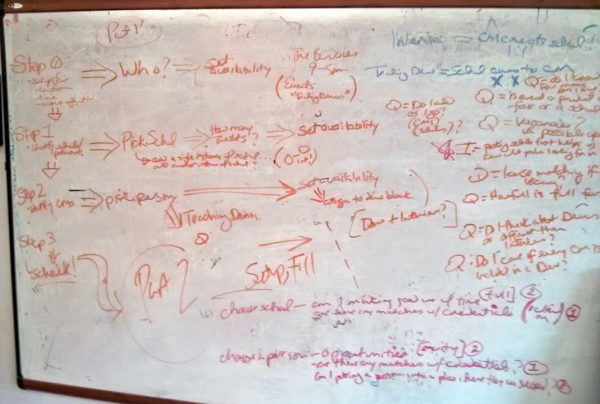 While doing research, my team and I kept track of new questions and research areas, in addition to refining the flows and subprocesses on a whiteboard next to our desks. Not all matches are created equal; not all interviewees were a good match for an interview opportunity. 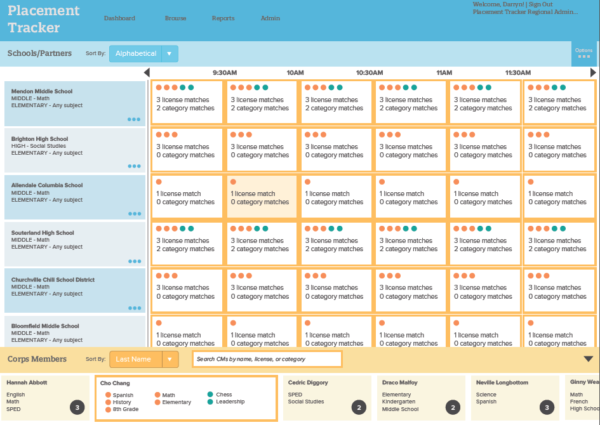 In this version, the colors and circles were added to help a user quickly compare and identify optimal opportunities for candidates, to ensure that the matchmakers were putting the right people in front of the right people. This concept evolved through focus groups and further study. The product further evolved as we tested and created a series of symbolic representations to capture not only data on “good fits” for an interview time slot, but to allow users to capture the results of an interview in real time and mark offers directly in the interface, automating the task of logging those results in another system. This greatly reduced the time users spent after the interview day performing data entry. The initial concept called for a “drag and drop” interface; however, it became quite clear through early testing that errant drops on complex grids frustrated users. We tested a “double clicks” where a user clicks a name, activating it, and then the interface would go into a “placement mode” showing openings ranked by alignment. The user would then have to click again on the opening they wanted to place it in. The results were immediate: users preferred the two-clicks method. There were no errant placements, no sliding scrolls while dragging; although this app was designed only for desktop at the time, it had the advantage of also being more mobile ready. There was some concern among other team members who were counting clicks, but the user feedback spoke for itself: more was definitely better. After successfully launching the Interview Matchmaker tool, we discovered another business team similarly had a complex, time-consuming many-to-many matchmaking problem. Using a lot of the foundational usability testing that informed the final design for this tool, we were able to quickly iterate and successfully design and launch a second match-making tool that similarly saw reductions in time to compliance and increases in data integrity.